In 1969, Westchester Publishing Services began as a small typesetting operation located just outside New York City. From that modest beginning 50 years ago, we have grown to a 400+ strong, employee-owned company with locations spanning the globe. We’re proud to provide a complete array of editorial and composition services for more than 150 client publishers in the trade, juvenile, academic, K-12, policy group, legal and professional publishing markets, customized to their specific workflows. Below are messages from a few of our clients and partners about Westchester’s golden anniversary. To add your message, please complete the form to the right! Congratulations to Westchester for 50 years of service to the publishers, authors, and readers. Here’s to your next 50 years! We’re proud of our friends at Westchester Publishing Services on achieving this monumental anniversary – like fine wine, you’ve matured very well. Cheers to another 50 years of success! Happy 50th Birthday to all our friends at Westchester. We always know we can count on you to make our books look great! Here’s to another 50 years of continued excellence. Congrats and best wishes to our friends at Westchester Publishing Services for continued success. 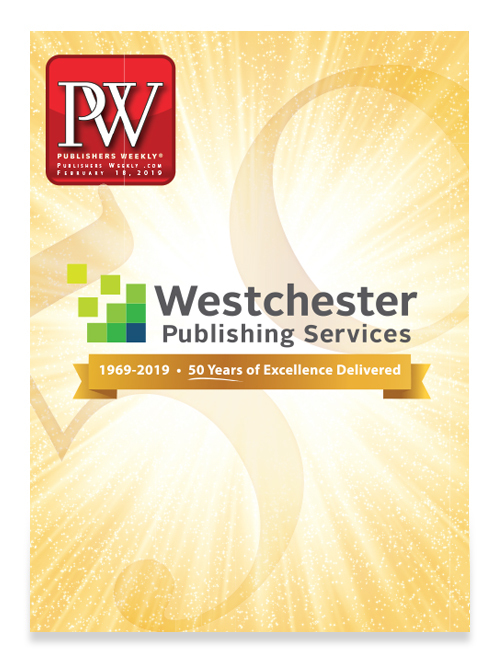 FableVision wishes the warmest congratulations to Westchester Publishing Services for their 50th anniversary celebration. Their team’s dedication to quality, service, and excellence are among the best in the business. The Gap, Yankee Candle, and Cracker Barrel—those monuments of culture hailing from the heights of 1969. You know them well. To their less ostentatious peer, in a class by itself, we must raise a proverbial glass—to Westchester. Long may it provide relief—and, of course, exceptional, affordable service—to the overburdened acquiring editor. Happy anniversary. Bryan Adams knew the “Summer of ‘69” was special, as do we in the educational publishing world. 50th Anniversary congratulations to Westchester Publishing Services, a great friend and partner in developing quality content for students! Congratulations on your 50th Anniversary! Thanks for the millions of pages you’ve set for us, your spirit of partnership and best wishes for your continued success! Wishing a happy 50th anniversary and continued success to our friends at Westchester Publishing Services. Your commitment to quality, service, and excellence is among the best in the business and greatly appreciated. Being in business for 50 years is a significant accomplishment – but when you’re as exceptional as Westchester is, you’re probably only getting started. Happy Birthday, Westchester. 50 looks great on you! Happy Birthday Westchester! Pluto is also celebrating our 50th anniversary in 2019. It’s a rare pleasure to work with a company that upholds the same strong ethical framework that we do. Here’s to another 50 years and to making the world a better place! A business that stands the test of time understands what their customers want and ensures they deliver it. Congratulations on your golden anniversary, Westchester! You continue to excel at providing great service on every project you do. Happy 50th Birthday Westchester! Lion Hudson Ltd is delighted to use your excellent services into the future. The Beatles give their final live performance on top of Abbey Road Studios. Sesame Street debuts on PBS, while across the pond Monty Python’s Flying Circus first hits the BBC airwaves. Neil Diamond released Sweet Caroline — so good, so good, so good!